You can add songs to iPhone 8/8 Plus from Mac without iTunes. Also, you can download music to iPhone from Youtube and the like. In this article, you will learn how to easily and fast add music to iPhone with the aid of iPhone music manager. Apple's iTunes is alienating its most music-obsessed users in music transfer and management. And to move music to iPhone, especially the odd new ones using iTunes is complex and disappointing. But fortunately, moving out of iTunes is easy as well as feasible. 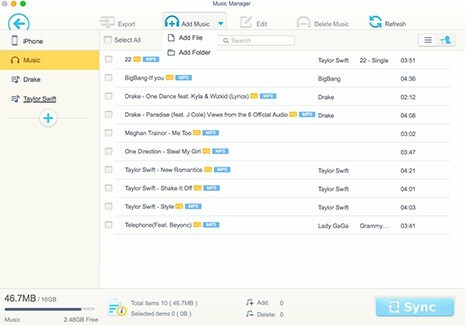 In this article, we'll introduce you a real music manager for iPhone to help you add music to iPhone 8/Plus from Mac/YouTube without iTunes and manage songs and playlists on your computer easily. Top-rated iPhone music manager - MacX MediaTrans can easily sync music to iPhone from Mac/YouTube without iTunes and manage songs and playlists on computer. MacX MediaTrans is the best iTunes alternative to help you add music to iPhone 8 from Mac directly and quickly. It also allows you to export iPhone music to Mac, as well. In addition, this iTunes alternative also performs an easy-to-use music manager to add playlist to iPhone, create playlist for iPhone, edit music info, bulk delete music from iPhone, turn any song as iPhone ringtone, etc. to better manage iPhone 8 music library. Step 1: Download and launch the best iTunes alternative for your Mac, and then connect your iPhone to computer with a USB cable. Step 2: Click "Music Manager" on the main interface to enter into iPhone music adding page. Step 3: Press "Add Music" and select the songs to transfer to your iPhone. Tips: To sync music to iPhone X/8/Plus, you can directly drag and drop the music to MediaTrans' interface. As long as your Internet connection is stable and fast, the songs will be transferred in a very short time with no limits at all. More amazingly, the built-in converter helps convert music soundtracks to compatible formats before you sync music to iPhone. On top of music, this iTunes alternative also enables you to add videos to iPhone, as well as pictures and documents in the same manner. In order to add YouTube music to iPhone X/8, you will need a powerful program like MacX Video Converter Pro which not only downloads music from YouTube but also converts YouTube music to iPhone. Take the following steps to add songs to your iPhone 8 or iPhone 8 Plus with ease. Step 1: Download MacX YouTube music downloader & converter and launch it. Step 2: Click YouTube, copy and paste the YouTube music URL to the type box. Then click "OK" to start to download the YouTube music. Step 3: Press "to iPhone", choose your iOS device as output format, and then hit "Run". Step 4: Repeat step 1, 2 and 3 of "How to Add Music to iPhone 8 from Mac Without iTunes". 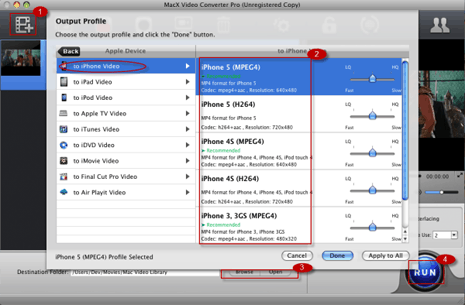 Although iTunes is regarded as the most familiar way to sync MP3 to iPhone and iOS devices. However, it is truly a challenging app for you to manually add songs to iPhone as you may be impeded in dealing with the complicate operations. Below are some unavoidable shortcomings of adding music to iPhone with iTunes that you need to know. # iTunes will erase the old music in iTunes Library when syncing new songs or playlists to an iPhone, which means the existing music may be deleted. # iTunes allows you to select playlists, artists, albums and genres to sync, but it doesn't empower you to go for specific songs directly. # iTunes failed to sync non Apple music to iPhone even though your music file is encoded by .aac codec. # The album artwork won't sync to your iPhone using iTunes. This error happens now and then. That's why we suggest you to transfer music to iPhone without iTunes! All-around iPhone video music manager provides users the superfast solution to fast transfer data from iPhone iPad to Mac/PC, including photos, videos, music, ebooks, ringtones and more without iTunes.